We operate an appointment system for all routine appointments with our doctors and practice nurses and try our best to get you the appointment you want with the doctor of your choice where this is possible. Appointments can be made by telephone from 8.00am or at reception or you can also book your doctor’s appointment via the internet. Please ask at reception for an internet registration form. 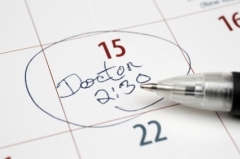 We aim to provide appointments within 48 hours where possible, however a few appointments are available for you to book beyond this for patients wishing to plan further ahead. Patients who need to be seen as an emergency will be seen on the day but may need to be assessed in the first instance by our practice nurses who will ensure that you are seen, or receive advice from, the most appropriate healthcare professional. Please note each appointment is 10 minutes long so only one problem can be dealt with per appointment. Please keep all your appointments or let us know if you are unable to attend. If you would like to speak to a doctor or nurse for problems that may not need a face to face consultation please ring the practice and where possible a doctor or nurse will ring you back when the surgery has ended. However please note that it is difficult to give you an exact time as the Doctors may be dealing with urgent appointments. Our surgery is accessible to wheel chair bound patients with car parking spaces available for disabled drivers. All consulting rooms are on the ground floor. However, if you feel that you may need further assistance when you visit us, please let the receptionist know when you make your appointment so that we can make any arrangements necessary to make your visit as comfortable as possible. It is also useful for us to know if you have any hearing or visual problems.